The used car industry is full of options, which can be overwhelming and downright confusing. Even after you’ve decided what type of car you want, you still have many possibilities to consider, many of which have to do with vehicle features and quality. A common differentiator in used vehicle sales is the Certified Pre-Owned mark. In recent years, Certified Pre-Owned (CPO) vehicle sales have risen. These vehicles seem like a good option for consumers, but what does the CPO sticker actually mean? What are the pros and cons of purchasing a CPO vehicle? Is the price of the CPO designation worth the benefits provided? If you’re shopping for a car and don’t want to pay the CPO premium, can you replicate the CPO benefits on your own less expensively? These are all questions we seek to answer below. Certified pre-owned, or CPO, is basically a marketing term developed by the automotive industry to make used cars easier to sell by offering consumers peace of mind benefits. Edmunds.com reports that CPO accounts for 20.4% of franchised dealer used car sales and is on the rise. CPO vehicle benefits include inspection, reconditioning, and certification by either the original manufacturer or the dealer. In addition, CPOs typically carry some form of extended warranty coverage to give the consumer added comfort in their purchase. The certified warranty will cover the vehicle for a certain number of months or miles after the original warranty expires. You should note, however, that not all CPO programs are created equal. Factory-backed CPOs are the best because they carry manufacturer-specific inspection and reconditioning requirements, will offer a built-in warranty backed by the original manufacturer, and are available only at authorized franchise dealerships. Dealer-backed CPOs typically also include warranty-like coverage in the form of an extended service contract. However, inspection requirements and terms depend on the selling-dealer, not a stringent manufacturer requirement. Either way, it’s important to review each manufacturer’s or dealer’s certification programs before purchasing so you fully understand the terms and coverage. For example, Cars.com offers a great overview of manufacturer CPO programs. How Much Does CPO Cost? While CPO vehicles provide legitimate benefits to consumers, they command a premium price compared to non-CPO cars. According to CNW Research, the price consumers are paying for CPO benefits is $2,800, which is the average amount more that dealers make on CPO cars compared to their non-certified counterparts. Factories and dealers will only offer certified pre-owned status on late-model, low-mileage vehicles (ie, less than 5 years old and fewer than 80,000 miles). In many cases, CPO vehicles are young enough that they still have the basic manufacturer’s warranty. This means you are paying a premium for comprehensive protection on a vehicle that likely will not require enough repairs to justify that degree of coverage. Sure, the comfort of a long-term comprehensive warranty is great, but is it worth the price of admission? Arguably, consumers may gain minimal benefit from CPO protection because they’re paying a premium for comprehensive coverage on a low risk car with original warranty remaining, but that depends on how much the consumer values the added peace of mind. Most cars more than four to six years old or that have more than 60,000 to 80,000 miles rarely qualify for CPO status. As such, customers shopping for older, higher mileage cars at lower price points may not have the CPO option available even though the peace of mind may be highly valuable given the added risk of that vehicle. So, while CPO status can provide some great protection, it is typically not available for a large segment of car buyers that would legitimately benefit from it. Do Alternatives to CPO Vehicles Exist? Fortunately, if you’re in the market for a vehicle and desire the CPO peace of mind, but you don’t want to pay the premium, you have alternatives that provide similar comfort and coverage at a more competitive price. Whether you’re in the market for an older vehicle that doesn’t qualify for CPO status or a newer model that does, you can replicate CPO coverage, usually at a cost well below the comparable CPO premium. If that’s up your alley, your first step is to take the vehicle to an independent mechanic you trust for a thorough pre-purchase inspection, which typically cost $75-$125. Next, purchase an extended vehicle service contract that provides the terms and coverage most important to you. The cost of these contracts varies by provider, vehicle, and terms desired, but you can often find prices well below the comparable CPO warranty through independent dealerships, national auto lenders such as USAA, or your local bank or credit union. As an example, CarLotz is a consignment store for used vehicles, and we often help our customers find a vehicle service contract that provides the coverage desired – from simple powertrain to comprehensive coverage. These often come at a 25-50% discount to comparable CPO coverage at traditional dealerships. 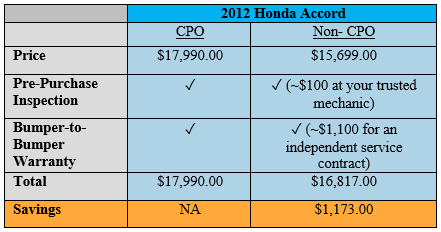 The chart below highlights how much you can save by creating your own version of a CPO vehicle. You’ll see in this example that the addition of a mechanic check-up and a full coverage service contract enables you to save roughly $1,200 over the same car with a CPO sticker. Whether or not you choose CPO, do research and find the best option for you! Purchasing a car is a significant investment, and finding the best fit is critical. Take the time to consider what car fulfills your needs and what degree of warranty coverage, if any, works best for you. CPO vehicles can be a great option for certain consumers, but as we’ve shown here, safety and coverage don’t have to come at a large premium. Finding the right car and the right protection for you is worth taking the time to check out options beyond only Certified Pre-Owned cars. A little extra investigation can yield some serious savings! Want more information on how to save a bunch of money on your next vehicle purchase? Give CarLotz a shout online or call us at 804-897-2757. We’re here to help! 0 comment(s) so far on Is Certified Pre-Owned Vehicle Marketing a Gimmick?